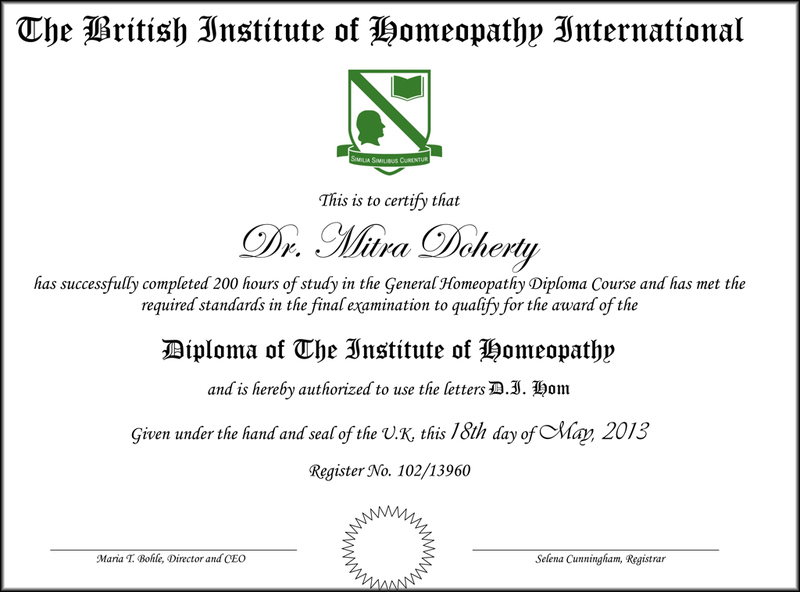 ...recognizes Dr. Doherty for having successfully completed 200 hours of study in the General Homeopahty Diploma Course and has met the required standards in the final examination to qualify for the award of the Diploma of The Institute of Homeopathy. 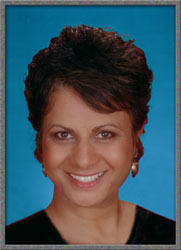 Dental surgeon Mitra Doherty graduated from Manchester University's School of Dentistry in 1980 and practices general dentistry giving full attention to personal patient needs, to the biological compatibility of dental materials and techniques, to aesthetics and to optimal means of preserving teeth with total adhesion. Dr. Doherty and her dedicated staff have created a unique dental practice through the use of biological dentistry. This is a form of dentistry that avoids the use of toxic materials in your mouth and integrates your dental health with your overall health. Her selection of materials is based on biocompatibility, comfort, aesthetics and durability. The "whole" patient's health is served by using relaxation techniques, EFT(emotional freedom technique), Nutritional counseling using Metabolic typing. The emphasis is on patient education, because properly informed patients are the persons best suited to ensure their own dental health and quality of life. Dr. Doherty has been recently accredited by the Board of Natural Medicine Practitioners - North America DNM to validate the augmentation of dental treatments with the natural therapies used to treat patients with the patient as an active participant in the healing process. Dr Doherty has practiced in both hospital and private offices and is a member of International Academy of Oral Medicine and Toxicology and the Canadian Academy of Cosmetic Dentistry. 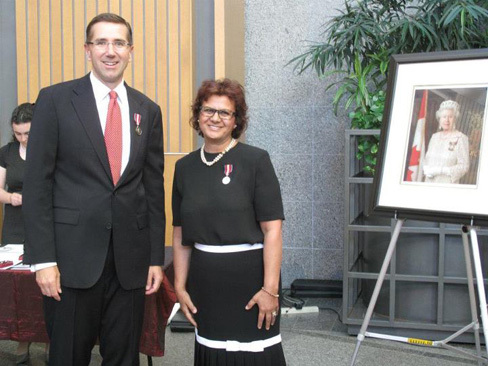 Dr. Doherty was honoured with a Diamond Jubilee Medal by the Honourable John Milloy in July 2012. The Tapping Technique - When pain flares up, a simple technique can help keep it under control. Nick Ortner, author of The Tapping Technique, explains how this combination of ancient Chinese acupressure and modern psychology can help you tap your pain away. Dr. Doherty is an individual officiate to the Earth Charter. In this capacity, she offers talks and slide show presentations to bring awareness to the Earth Charter document.